If you are trying to redeem free promotional games or software from Oculus for your Gear VR, view this. When you connect the headset to your device, the Oculus software installs. Follow these steps to detach your device from the Samsung Gear VR. Follow these steps to attach your device to your Gear VR. For step-by-step setup instructions for your Samsung Gear VR, view this info. To create a new Google (Gmail) account for your Samsung Galaxy S6 / S6 edge, view this info. Here's how to perform a quick setup for your Galaxy S 6 / S 6 edge. To transfer/move/upload picture or video files between your Samsung Galaxy S6 / S6 edge and your computer/PC, view this info. If you're having other issues with your phone or device, visit our Troubleshooting Assistant. These walk you through solutions for issues you may have with your device. An interactive map of the Home screen and buttons on your Samsung Galaxy S 6. Learn how to power on and shut down your Samsung Galaxy S 6. Learn how to use the Ultra Power Saving Mode to extend your battery life on your Samsung Galaxy S® 6. Here's info on the battery specs (e.g., Usage Time, Standby Time, etc.) for your Galaxy S6 / S6 edge. View this info regarding a simulated battery pull for your Samsung Galaxy S6 / S6 edge. View these tips to improve the battery life of your Samsung Galaxy S6 / S6 edge. This info helps if you want to turn the Power Saver setting for your Samsung Galaxy S6 / S6 edge on/off. Learn how to switch to Emergency mode to save your Samsung Galaxy S 6's battery life for the most important functions. Learn how to pair your Samsung Galaxy S® 6 with a Bluetooth® device and connect to a Wi-Fi network. To make your Galaxy S6 / S6 edge visible to Bluetooth devices, view this info. To send/share a contact from your Samsung Galaxy S6 / S6 edge via Bluetooth, view this info. This info helps if you need to turn Bluetooth on your Samsung Galaxy S6 / S6 edge on/off. Find out how to pair your Samsung Galaxy S 6 with your Bluetooth device. Learn how to call and message using Bluetooth® and contacts on your Samsung Galaxy S® 6. Here's how to activate the Wi-Fi Calling feature on your Samsung smartphone. Here's how to send unwanted calls directly to voicemail for your Galaxy S6. This info helps if you want to place a conference call from your Samsung Galaxy S6 / S6 edge. When turned on, Wi-Fi Calling may improve indoor call quality for your Galaxy S6 / S6 edge. To view or clear the call history on your Galaxy S 6 / S 6 edge, check out this info. An interactive guide on how to call a contact using your Samsung Galaxy S 6. Discover how to use your Samsung Galaxy S 6 to call a new number. Learn how to change the ringtone on your Samsung Galaxy S 6. A visual guide for ignoring a call and sending a text message to the caller with your Samsung Galaxy S 6. A visual guide on how to return to a call after multitasking, like browsing the Internet, on your Samsung Galaxy S 6. Learn how to switch between two phone calls on your Samsung Galaxy S 6. Find out how to teach kids to call 911 on your Samsung Galaxy S 6. Discover how to use your voice to place a call with your Samsung Galaxy S 6. Discover how to view a missed call and add it as a new contact on your Samsung Galaxy S 6. Here's info on common camera settings (e.g., flash, HDR, etc.) for your Galaxy S 6 / S 6 edge. To record and share a video on your Samsung Galaxy S6 / S6 edge, view this info. This helps if you want to save a website image on your Samsung Galaxy S6 / S6 edge. To share a picture that's saved in the Gallery of your Samsung Galaxy S6 / S6 edge, view this info. To share a video that's saved in the Gallery of your Samsung Galaxy S6 / S6 edge, view this info. To view pictures/videos you've saved in the Gallery on your Samsung Galaxy S6 / S6 edge, see this info. Discover how to take a picture using your Samsung Galaxy S 6. Learn how to take a picture of the screen and view it on your Samsung Galaxy S 6. Learn how to adjust the picture settings for easy sharing in emails, social network posts and more on your Samsung Galaxy S 6. Learn how to record a video using your Samsung Galaxy S 6. A visual guide for sharing photos by email, social networks and more using your Samsung Galaxy S 6. See how to take a picture while recording a video on your Samsung Galaxy S 6. An interactive guide on how to take a selfie with your Samsung Galaxy S 6. A visual guide for how to take a picture with the flash on using your Samsung Galaxy S 6. Learn how to zoom in and out when taking photos on your Samsung Galaxy S 6. If you can't transfer media between your Galaxy S6 / S6 edge and PC, view this info. Follow these steps to add a contact to your Samsung Galaxy S6 / S6 edge. View this info to configure how the contacts on your Samsung Galaxy S6 / S6 edge are saved. This info helps if you want to delete a saved contact from your Samsung Galaxy S6 / S6 edge. This info helps if you want to edit a saved contact on your Samsung Galaxy S6 / S6 edge. Learn how to add a new contact to your Samsung Galaxy S 6. Discover how to add or delete contacts from your Favorites list on your Samsung Galaxy S 6. Learn how to share the information for one of your contacts with someone else using your Samsung Galaxy S 6. Discover how to add a picture to a contact on your Samsung Galaxy S 6. Learn how to assign a ringtone to a contact, so you know who's calling your Samsung Galaxy S 6 without looking at it. A visual guide for how to create a group of contacts on your Samsung Galaxy S 6. Here's how to restrict the amount of data an app uses on your Galaxy S6 / S6 edge. To turn the Mobile Data setting on your Samsung Galaxy S6 / S6 edge on/off, see these steps. If your Galaxy S6 / S6 edge shows the incorrect date and/or time, view this info to correct it. Here's how to help determine if your Samsung device has liquid damage. To view the device ID (IMEI) on your Samsung Galaxy S6 / S6 edge, follow these steps. To view the MAC address for your Samsung Galaxy S6 / S6 edge, follow these steps. To view phone info (e.g., network, IP address, Wi-Fi address, etc.) for your Galaxy S6 / S6 edge, see this info. If your Samsung Galaxy S 6 / S 6 edge crashes, resets or runs slow, or apps freeze or reset the device, view this. Here's info on restricting access to apps and stored media content for your Samsung Galaxy S6 / S6 edge using Kids Mode. If the display on your Galaxy S 6 / S 6 edge doesn't rotate, this shows how to fix it. Explore how to access settings on your Samsung Galaxy S 6 to change alert sounds, turn off GPS and more. A visual guide for saving battery life on your Samsung Galaxy S 6 by adjusting the screen timeout. Explore ways to mute your Samsung Galaxy S 6. An interactive guide for setting your Samsung Galaxy S 6 to Airplane mode. Learn how to set up email quickly and efficiently on your Samsung Galaxy S® 6. If you need help adding a personal (POP/IMAP) email account to your Samsung Galaxy S6 / S6 edge, follow these steps. Here's how to add an existing Google (Gmail) account to your Samsung Galaxy S6 / S6 edge. This info shows how to compose and send an email message on your Samsung Galaxy S6 / S6 edge. This info helps if you want to delete an email message from your Samsung Galaxy S6 / S6 edge. This info shows how to delete a Gmail message from your Samsung Galaxy S6 / S6 edge. Here's info on personal email settings (e.g., account name, etc.) for your Galaxy S® 6 / S 6 edge. To modify data usage options for the personal email account on your Galaxy S 6 / S 6 edge, view this info. If you're not getting notifications for the personal email on your Galaxy S 6 / S 6 edge, view this info. Here's how to update the personal email password/server settings for your Galaxy S 6 / S 6 edge. To enter or edit the personal email signature on your Galaxy S 6 / S 6 edge, view this info. To adjust the personal email sync frequency settings on your Galaxy S 6 / S 6 edge, view this info. This info helps if you want to configure the notification settings for the Gmail account on your Samsung Galaxy S6 / S6 edge. Here's info on updating work email settings for your Galaxy S 6 / S 6 edge. Removing then re-adding a work email account on your S 6 / S 6 edge often fixes email issues. Removing then re-adding a Gmail account on your Galaxy S 6 / S 6 edge often fixes email issues. Removing then re-adding an email account on your Galaxy S 6 / S 6 edge often fixes email issues. This shows how to reply to a Gmail message on your Samsung Galaxy S6 / S6 edge. Follow these instructions to reply to an email message on your Samsung Galaxy S6 / S6 edge. Here's how to add a work email account on your Galaxy S 6 / S 6 edge. To view the Gmail account address or username associated with your Samsung Galaxy S6 / S6 edge, view this info. Here's info on how to view a Gmail message on your Samsung Galaxy S6 / S6 edge. Learn how to attach a file, like a document or photo, to an email with your Samsung Galaxy S 6. Learn how to forward an email on your Samsung Galaxy S 6. Discover how to reply to an email on your Samsung Galaxy S 6. A step-by-step visual guide for sending an email from your Samsung Galaxy S 6. Learn how to access your work email on your Samsung Galaxy S 6. Discover how to access your existing email account on your Samsung Galaxy S 6. Discover how to access different email accounts on your Samsung Galaxy S 6. To configure the GPS location settings on your Samsung Galaxy S6 / S6 edge, view this info. Add apps and widgets to your home screen. Customize your wallpaper. Learn how on your Samsung Galaxy S® 6. To add shortcuts to the Home screen of your Samsung Galaxy S6 / S6 edge, see these steps. To add a widget (e.g., weather, clock, etc.) to a Home screen on your Galaxy S6 / S6 edge, view this. This info helps if you want to remove items from the Home screen on your Samsung Galaxy S6 / S6 edge. An interactive guide on how to place widgets and apps on the Home screen of your Samsung Galaxy S 6 for quick access to them. Learn how to add folders to the Home screen on your Samsung Galaxy S 6 to help organize your apps. An interactive guide on how to access your favorite apps right from the Lock screen on your Samsung Galaxy S 6. A visual guide for adding and deleting Home screens on your Samsung Galaxy S 6. Learn how to rearrange and resize widgets and apps on the Home screen of your Samsung Galaxy S 6. Learn how to change the default Home screen of your Samsung Galaxy S 6. Discover how to remove widgets and apps from the Home screen of your Samsung Galaxy S 6. Find out how to use shortcuts to unlock the screen of your Samsung Galaxy S 6. To change the Mobile Hotspot password on your Galaxy S® 6 / S® 6 edge, view this info. This shows how to change the broadcast channel for the Mobile Hotspot feature on your Samsung Galaxy S6 / S6 edge. To turn Mobile Hotspot on/off on your Galaxy S® 6 / S 6 edge or if you can't connect to Wi-Fi, see this. An interactive guide for setting up your Samsung Galaxy S 6 as a Mobile Hotspot, so you can share your data connection with other devices. Browse the web on the go with Google Chrome on your Samsung Galaxy S® 6. If you can't browse the Internet or view website images on your Samsung Galaxy S6 / S6 edge, view this info. If you're having other issues with your phone or device, visit our Troubleshooting Assistant. These walk you through solutions for issues you may have with your device. To change the browser Home page on your Samsung Galaxy S6 / S6 edge, see these steps. This can help if you're unable to browse the Internet or a web page won't display on your Samsung Galaxy S6 / S6 edge. Our Troubleshooting Assistant can help you with other device issues if you aren't currently using the tool. Learn how to bookmark a website on your Samsung Galaxy S 6, so it's easy to find later. Discover how to find a website using your Samsung Galaxy S 6. See how to search the web using your voice with your Samsung Galaxy S 6. A visual walkthrough of opening, closing and switching between windows or tabs in the web browser of your Samsung Galaxy S 6. To change the language on your Samsung Galaxy S6 / S6 edge (English to Spanish, Spanish to English), view this info. Discover how to change the language settings on your Samsung Galaxy S 6. Increase the security of your phone. This video shows how to set a pattern lock on your Samsung Galaxy S® 6. To manage the notifications that appear on your Samsung Galaxy S6 / S6 edge when the screen is locked, view this info. This info helps if you want to add/remove a fingerprint scan as a lock option for your Samsung Galaxy S6 / S6 edge. View this info for options to lock your Samsung Galaxy S6 / S6 edge. Here's how to turn on and customize the Smart Lock setting on your Galaxy S6 / S6 edge. To disable the screen lock setting on your Galaxy S6 / S6 edge, view this info. Here's how to unlock the screen on your Samsung Galaxy S 6 / S 6 edge. A visual guide for setting screen security on your Samsung Galaxy S 6 to help protect your private information. Learn how to unlock the screen on your Samsung Galaxy S 6. To free up space if your Samsung Galaxy S6 / S6 edge runs slow or crashes/resets, apps freeze when running them, or you can't save media, view this info. If you're having other issues with your phone or device, visit our Troubleshooting Assistant. See how to put in and take out a microSD card from your Samsung Galaxy S 6 to add memory for photos, videos, music, documents and more. To play Music files on your Samsung Galaxy S6 / S6 edge, see these steps. Learn how to create a station on Milk Music™ with your Samsung Galaxy S 6. Explore how to listen to music using Milk Music on your Samsung Galaxy S 6. See how to use the Milk Music dial on your Samsung Galaxy S 6. Multitask by using two apps at the same time with Split Screen on your Samsung Galaxy S® 6 from Verizon. Take a tour of your Samsung Galaxy S® 6, including unlocking the phone, viewing the notifications panel, tips on apps and more. Learn how to manage location settings on your Samsung Galaxy S 6. Discover how to manage data usage on your Samsung Galaxy S 6. An interactive guide on how to easily switch between and close apps that are running on your Samsung Galaxy S 6. A visual guide for swiping between multiple Home screens on your Samsung Galaxy S 6. Learn how to use Multi Window on your Samsung Galaxy S 6. Discover how to use picture-in-picture video on your Samsung Galaxy S 6. Discover how to access and clear the Notification Panel on your Samsung Galaxy S 6. Share pictures and more with the tap of your phone. This video shows how to use NFC on your Samsung Galaxy S® 6. To set up your Galaxy S6/S6 edge to pay for items by touching your phone to a reader at a checkout register, view this info. To turn Android Beam on your Samsung Galaxy S6 / S6 edge on/off, view this info. This info helps if you want to turn the Near Field Communication (NFC) setting on your Samsung Galaxy S6 / S6 edge on/off. If you're having other issues with your phone or device, visit our Troubleshooting Assistant. These walk you through solutions for issues you may have with your device. Learn how to use NFC and Android Beam on your Samsung Galaxy S 6 to wirelessly transmit information to other compatible devices. To wirelessly transfer data from your Galaxy S6 / S6 edge to another NFC-capable device, view this. If your Galaxy S 6 / S 6 edge has a blank or frozen screen or calling, app, audio and syncing issues, view this. Here's how to reset your Galaxy S 6 / S 6 edge if it has a blank or frozen screen or calling and app issues. Before performing a factory data (hard) reset on your Samsung Galaxy S6 / S6 edge, view this info on backing up contacts, media, apps, etc. To check for or to install software updates on your Galaxy S 6 / S 6 edge, view this info. To view the software version your Galaxy S 6 / S 6 edge is running, check out this info. Here's how to unlock your screen if you can't remember your password, PIN, pattern or fingerprint for your Samsung device. If the SIM PIN for your Galaxy S 6 / S 6 edge is blocked, here's how to unblock it. To view the view the 20-digit SIM card number for your Samsung Galaxy S6 / S6 edge, follow these steps. Discover how to put in and take out a Nano SIM card from your Samsung Galaxy S 6. Discover how to access your Facebook account on your Samsung Galaxy S 6. Learn how to log out of Facebook on your Samsung Galaxy S 6 to help protect your account. A visual walkthrough on how to update your Facebook status and post photos using your Samsung Galaxy S 6. To record and play a sound file using the Voice recorder on your Samsung Galaxy S6 / S6 edge, view this info. If you received a sound file on your Samsung Galaxy S6 / S6 edge via a multimedia message, here's how to save it as a ringtone. Follow these steps to choose/change a ringtone for your Samsung Galaxy S6 / S6 edge. To utilize the speakerphone functionality on your Galaxy S 6 / S 6 edge, view this info. To place your Samsung Galaxy S6 / S6 edge in Vibrate Mode, see these steps. Learn how to set up the Favorite Contacts screen in Easy mode on your Samsung Galaxy S 6. Discover how to set up the Favorite Apps screen while in Easy mode on your Samsung Galaxy S 6. Discover how to make a phone call in Easy mode on your Samsung Galaxy S 6. A visual guide for navigating multiple Home screens in Easy mode on your Samsung Galaxy S 6. Learn how to switch back to Standard mode from Easy mode on your Samsung Galaxy S 6. Learn how to switch to Easy mode for simplified Home screens on your Samsung Galaxy S 6. Here's how to view signal strength on the Samsung Galaxy S 6 / S 6 edge. Follow these steps to create and send a text message on your Samsung Galaxy S6 / S6 edge. Follow these steps on your Samsung Galaxy S® 6 / S® 6 edge to cut, copy and paste text. This info helps if you want to delete text messages from your Samsung Galaxy S6 / S6 edge. To change the default text messaging (SMS) app on your Samsung Galaxy S6 / S6 edge, follow these steps. This helps if you want to configure notifications for text messages on your Samsung Galaxy S6 / S6 edge. To add, remove or edit the text message signature on your Galaxy S6 / S6 edge, view this info. To receive delivery confirmation for messages sent from your Galaxy S6 / S6 edge, view this. Here's how to change permissions to allow or block sending premium texts from your Galaxy S6 / S6 edge. If you need to know how to view text messages on your Samsung Galaxy S6 / S6 edge, view this info. View this info to take a picture of the screen on your Samsung Galaxy S6 / S6 edge. To set up your Samsung Galaxy S6 / S6 edge for printing, view this info. 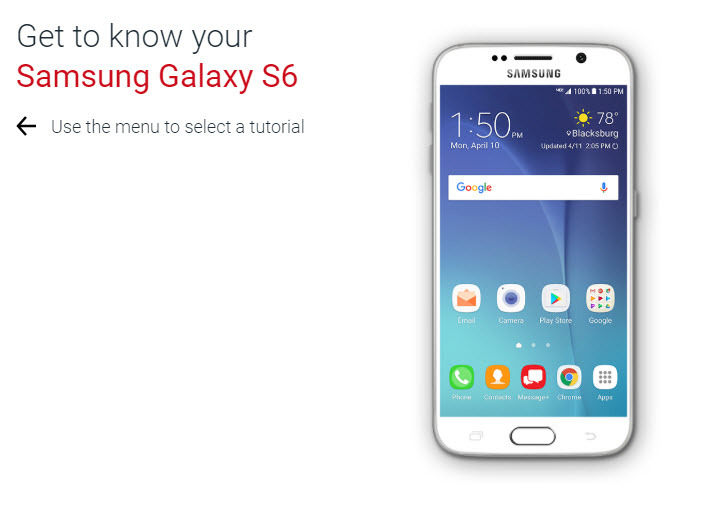 Discover how to find videos and tutorials to learn more about using your Samsung Galaxy S 6. Here's how to view the screen of your S6 / S6 edge on your TV or another media device. To change the TTY settings on your Galaxy S 6 / S 6 edge, check out this info. If the color scheme on your Galaxy S 6 / S 6 edge is reversed, view this. This info helps if you want to save a picture as wallpaper on your Samsung Galaxy S6 / S6 edge. Find out how to change the background of the Home screen on your Samsung Galaxy S 6. To turn the Wi-Fi Direct setting for your Samsung Galaxy S6 / S6 edge on/off, view this info. If you need to add a Virtual Private Network (VPN) to your Samsung Galaxy S6 / S6 edge, follow these steps. To allow your Galaxy S 6 / S 6 edge to auto switch between Wi-Fi and mobile data, view this. View this info if the Wi-Fi network you want to add to your Galaxy S6 / S6 edge doesn't display. To remove a saved Wi-Fi network from your Galaxy S 6 / S 6 edge, view this info. Follow these steps to use your Samsung Galaxy S6 / S6 edge as a tethered connection via a USB or Bluetooth. For faster downloads on your Samsung Galaxy S6 / S6 edge, view this info on simultaneous use of Wi-Fi and LTE networks. Learn how to use your Samsung Galaxy S 6 to connect to a Wi-Fi network, so you can access the Internet without using data.